Or, how gestational diabetes is already saving me money! Food on the run has always been my Achilles' heel. Ordinarily, I wouldn't think twice about having Sunday lunch out--even though we drive past 3 lovely parks on the long drive home. Wow! I'm just looking at the times of your last two posts! When DO you sleep? Your lunch looks better than fast food and I covet the napkin. I have the tablecloth that matches but not the napkins. I found the tablecloth at the local Goodwill for $4.50 and am thrilled with it. Take care! There comes a point in pregnancy when sleep is nearly impossible! Sunday after church is the most tempting time to eat out for me, too. And I don't have the excuse of being pregnant or of having a long drive--it's just two miles home. So I try to prepare ahead by having a cold lunch ready in the summer, or something in the crockpot or oven (with auto-on and auto-off times set). I'd love to have you post your ideas for Sunday lunch and read ideas from your readers, too. 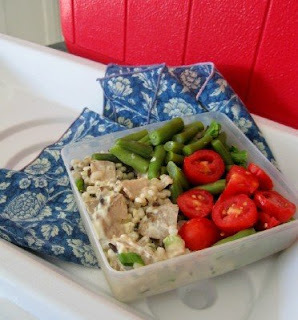 For the last few weeks I've been packing our lunch to take to the pool and I agree, it is a money saver! I know you have heard this a million times but your photography is amazing. I need to spend more time with my camera. What a great idea! I've never thought about having a picnic on the way home from church. I think I'll have to plan this!! Yummy. I love picnics like that. Healthy food is so colorful isnt it? There are side benefits to dietary restrictions aren't there--I've found that out with my son's food allergy. We have such a lovely park with ducks to feed , Koi to admire , playgrounds to climb on and fishing ponds . I think some cold fried chicken , iced tea , a biscuit or two and some of your beautiful tomato , sounds lovely !!! Oh, that looks yummy! I agree that Google is grand. The internet can be a very small world sometimes! I'm glad you found me that way too! I never eat out - never - it cost a ton on money and the food is not the best (especially the Applebees/Ruby Tuesday/ type food - loaded with fat and salt. I always have at least six meals frozen and always have the ingredients to make a low fat pasta dish that can be ready in a few minutes. A picnic is great and the ants can eat the crumbs ! Once you make the rule never to eat out planning becomes much easier. Have a look at Cooks Illustrated Magazine in the library for some inspiration and direction. Pregnancy is the only time I watch every bite and feel the healthiest! I followed the First Place program to avoid gestational b/c diabetes runs in my family. Before I became pregnant for the 3rd and last time, I was taking a prescription to lower my blood sugar...I discontinued it, got pregnant, and haven't been back on it since delivery 3 yrs ago. I thank the Lord for His mercy. The picnic sounds great....bravo for your creativity. Hope you're feeling well. Good luck on your food plan. I plan pretty carefully for Sundays - with small children, church can be stressful to begin with and then a quick lunch before naps! I actually made a list recently of ideal Sunday lunches - like Marsha said, something cold ready in the fridge, or something hot from the timed-bake or crockpot. I think a picnic is a great idea too - we are able to walk to church, but we could also walk to the park on the way home! That looks delicious! I admire your creative and positive approach to dealing with gestational diabetes. By my last pregnancy, while still in the normal range, I had to watch my diet a little more closely. And I really struggled with the restrictions! But your picnic lunch makes eating frugally and healthfully look like a walk in the park! I hope you are feeling well and enjoying the benefits of a healthier lifestyle. Wow! It's like I've known you for years - was thinking about you while on vacation with my family and all that I was missing on your blog - all while on a ship and looking at God's wide, wide Pacific - Just the four of us in Victoria, Canada! Exploring the royal family's history and high tea at 2! Prayed for your strength and endurance! Four meatloves for the freezer girl? YOU HAVE BEEN BUSY, as usual! LOL! Latrice "Working Mama in the NW!"